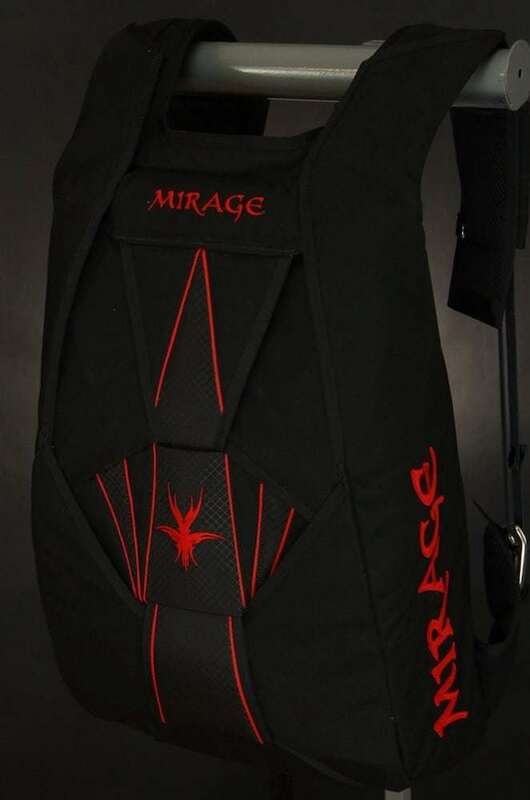 The Mirage G4 Skydiving Container by Mirage Systems is a high quality harness/container system for the gear conscious skydiver. Designed, tested, and jumped by professional and competition skydivers and built with the finest materials, the highest level of quality control, and refined designs – it’s no wonder they call it Alien Technology. If you’re looking for the very best skydive container that will continually meet the needs of our demanding sport, then look no further… Mirage has your back! The new Mirage G4 yoke is a 2 piece “split” design with several advantages. It allows the reserve risers to flow more naturally over the shoulders and into the reserve container, resulting in a more supple, comfortable feel around the neck. It is more adaptable to variations in reserve pack jobs. It also allows a smaller reserve pin cover flap, which needs smaller tuck tabs, which in turn makes the reserve easier to pin check. You’ll forget you are wearing a rig! 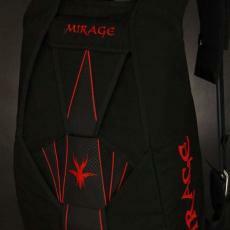 With the exception of the backpad area, all Mirage containers carry identical padding. 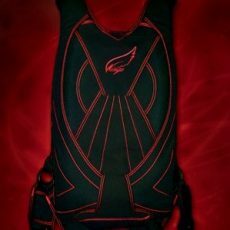 The legstrap padding is thick, firm and practically indestructible, so that even after thousands of jumps they will feel as comfortable as they do on Day one. The harness padding is mostly over the shoulders, where the rig rests. 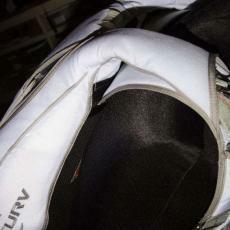 On the Unisyn harness all ring locations are also padded, so no hardware contacts the wearer. Your rig moves with you, not against you. Much of the comfort of a rig comes from the way the harness conforms to the user’s body. 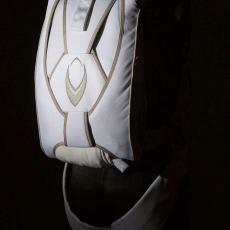 The Mirage Unisyn harness was specifically designed to flex at the natural junction points of the human body. 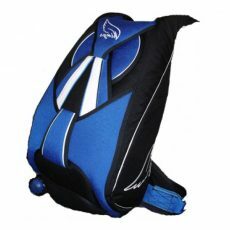 This design has helped to eliminate harness buckling and twisting, as the harness takes straight paths between junction points. The Unisyn moves with you, on the ground and in the air, so well that some users have said it didn’t feel like they had a rig on. Your canopy never peeks out! In freefall loose flaps are sloppy, distracting and potentially downright dangerous. Mirage containers are well known for staying closed until YOU want them open. In fact, our main pin protection is so tight that the main pin cover doesn’t even come open on deployment. We have zero bridle exposure, and our riser cover security sets the industry standard for reliability. Rigs designed with high speed flying in mind. 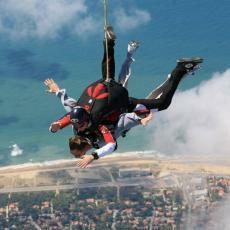 Freeflying pushes any rig to the limit by applying high aerodynamic forces at arbitrary angles. At these speeds and attitudes loose flaps and premature deployments are absolutely unacceptable. Mirage containers are designed with these principles in mind because vertical flying is the most challenging environment that a rig will be called to deal with. 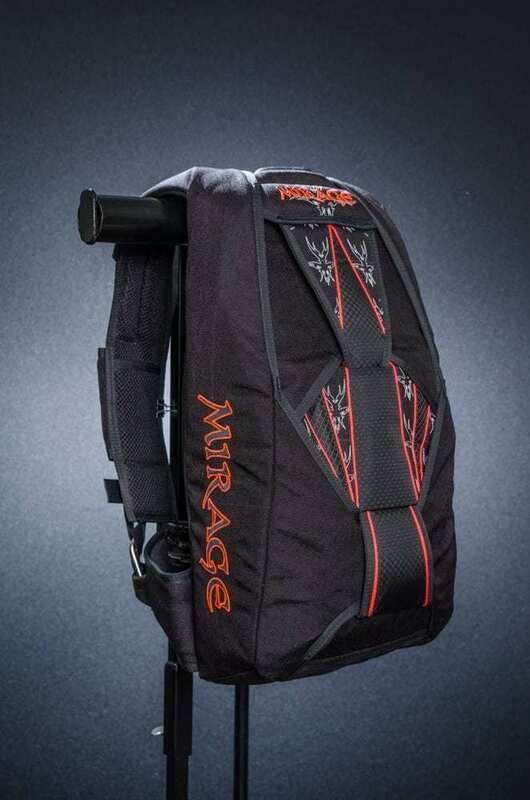 Bridle exposure, riser retention, pin covers and other critical components are all tested and proven to provide Mirage owners with confidence and peace of mind. They stay put regardless of your attitude. We at Mirage Systems believe that tuck tab riser covers are the best possible way to armor an area of the container that would otherwise be extremely vulnerable to wind forces. 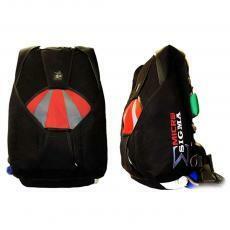 Our tuck tabs are designed modularly, to facilitate in-field replacement. The attachment location is placed over the shoulder, near the front of the rig, to allow for variation in reserve pack jobs. 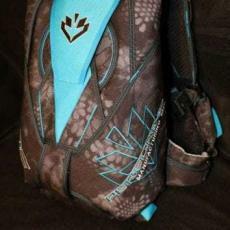 The profile of the tuck tabs is squared, for positive retention and fixed release force. Mirage Systems guarantees that our tuck tab riser covers will work as they were designed for the life of the container. Lines and toggles remain secure in freefall. We also provide secondary riser covers. These small riser covers are located under the main riser covers, along the side of the reserve container, to contain the main toggles and steering lines. They prevent any sort of displacement or accidental deployment during multi-attitude (back or head to earth) jumps. Maximum security where it counts. Pin protection on both main and reserve containers is critical to safety. Accidental pin releases caused by brushing against something when sitting down in the plane, the door on exit, other jumpers in freefall, or lines in a canopy collision can lead to unintended and/or out of sequence deployments. 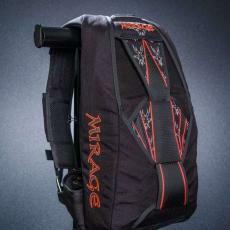 The design of the Mirage provides the most pin security currently available in the industry. Fast reserve deployment, only when needed. Our reserve pin cover flap uses a unique pocket to tuck away the flap ends. The tongue of the pin cover slips into a pocket in the center flap, and contains a built-in hinge to assist separation during reserve deployment. Furthermore, because the pocket opening is located directly over the outside edge of the reserve pilot chute cap, the deployment force of the reserve pilot chute spring serves to untuck (slide out) rather than unfold (bend out) the reserve pin cover and #6 flap. This helps preserve pilot chute energy for the main job – launching your reserve. Technology enabled security, comfort, and mobility – in a harness! 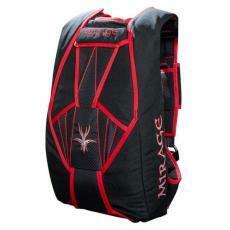 Mirage Systems takes pride in its ability to offer the most comfortable harness/container systems on the market. 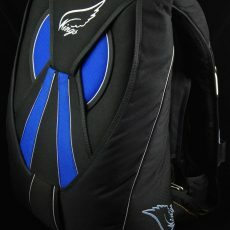 We build three strong, comfortable harnesses from which you may choose. Our standard harness is available with every size and model container we offer. 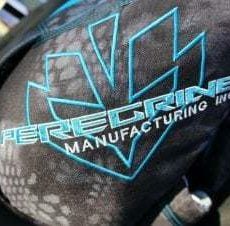 It benefits from 25 years of accumulated harness research and development, while providing you with the best fit and comfort available in a non-articulating design. Our hip-ring design is available for those who require increased flexibility to perform manuevers in their harness. Rather than stitching, a piece of hardware is installed at the lower junction of the harness. 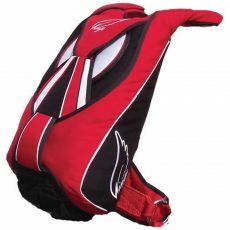 This allows coordinated movements at any angle while eliminating the binding of harness materials. For those who desire maximum security, flexibilty, and comfort, we offer the greatest achievement in harness design to date. We call it the Unisyn. The Unisyn harness is the most articulating, conforming harness on the market. By re-engineering the way we attach harness components, we were able to position both hip and chest rings without compromise. We designed a harness that effortlessly moves where you do. Choose the harness that’s right for your needs! Once an order is submitted we will contact you to review your order, make any necessary changes and provide you a final price including shipping and additional options selected on the order form.